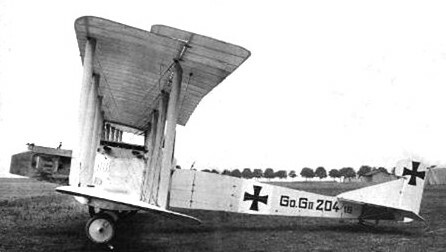 The Gotha G.II and G.III bombers made their appearance in 1916. The two bombers were remarkably similar, differing only in their engines and internal details. The G.II entered service in March of 1916 and was powered by a pair of 164kW six-cylinder liquid-cooled Mercedes DIV engines mounted in a pusher configuration. Some 15 G.IIs were used in the Balkans until they were withdrawn due to unreliable engines. The G.II used straight-eight DIV engines of 220hp, the G.III straight-six DIVa's with 260hp. Also the G.II did not have the trap-door, this was on G.IIIs only. Only 10 G.IIs were apparently built.